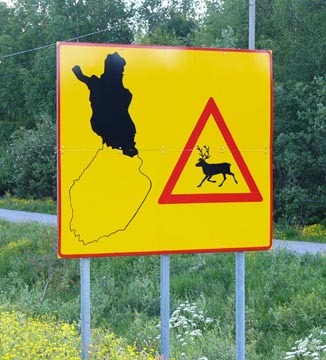 The sign says it; the whole northern reach of Finland is "reindeer crossing." Or maybe not crossing, maybe just coming straight down the road with no particular concern for being in the right lane. We thought that, being so close, it would be a shame not to spend some time above the Arctic Circle. So after our days in Helsinki, we left on the night train to Rovaniemi. The train that left on our track just before our train was the “night train to Moscow.” That sounded like the title for a movie starring Bogart and Bacall, a good old Cold War movie, screenplay by John LeCarre... much more romantic sounding than a night train to – where? 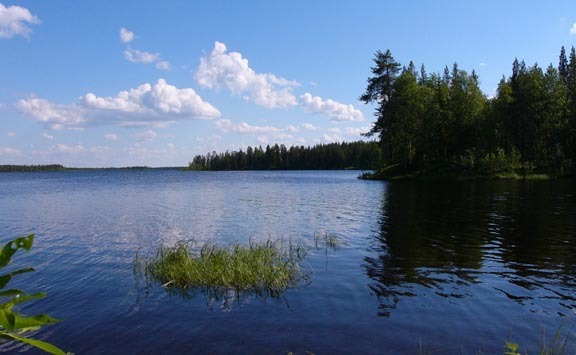 Rovaniemi: a smallish city about eight kilometers from the Arctic Circle. The train was great. 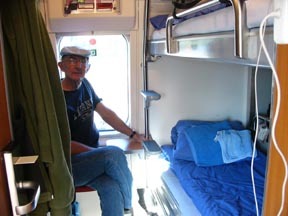 We had a sleeper compartment, which means a closet-sized roomette with two bunks already made up, an in-room toilet which could be turned into a shower (hold the bad jokes, please), and next to no place to sit to enjoy the passing scenery, which could be enjoyed all night since it is just not getting dark over here these days. It was an electric train - all the way. I assumed we would get out of the city under electric power then switch over to diesel, but so far as I could tell, we were under the electric wires the whole way. These people have been getting serious about living without petroleum. They also seem to maintain their tracks; one can walk to the bar car without getting slammed from wall to wall in narrow corridors. And it was a good bar car – Lapin Kulta on tap (pints filled all the way up) – and tracks so well-maintained that not a drop was slopped. We got to Rovaniemi around eight o’clock in the morning, three minutes late. If you have traveled on Amtrak in America, you probably have some understanding of what it means to say the train was only three minutes late; usually Amtrak rounds it off its lateness to the nearest hour on a good trip, the nearest half-day on a bad trip. This is because in Europe they have this radical notion that people come first – before the freightcar loads of lumber, automobiles, grain, coal, whatever, you try to get the people where they need to go. Rovaniemi is a smallish city which has been a mining town and a logging town, and is now one of the tourist gateways to the far frozen north. 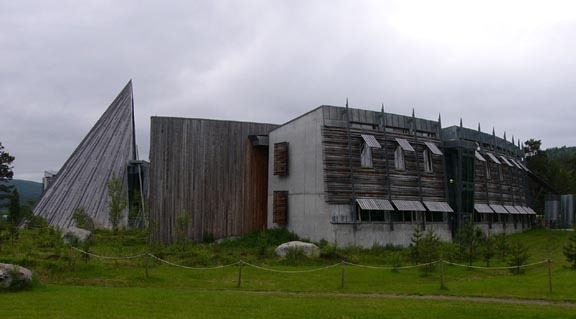 It has attractions ranging from the ridiculous – a Santa Claus fixation and a love affair with a hard-rocking madman/monster called Lordi – to the sublime: the Arktikum, a wonderful modern museum about life in the Arctic Zone around the world. 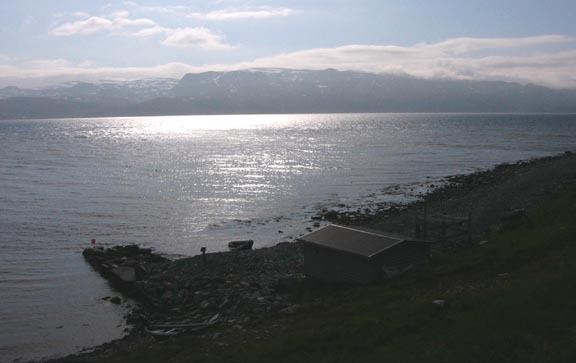 For those who don’t know, the Arctic Circle is a latitudinal line at 66 degrees, 33 minutes and 7 seconds, above which line the sun is visible above the horizon around the clock (provided there’s no geographic feature in the way, which there usually is). 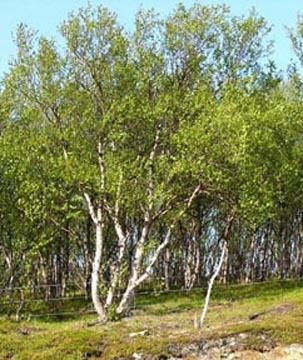 That is, however, just one way of defining the “arctic zone.” Biologists tend to think of it in terms of treelines – the point beyond which weather conditions preclude any life taller than windbeaten bushes and a lot of tiny plants that took a long time to even get tiny. Hydrologists and meteorologists think of the arctic as the usual extent of the year-round sea ice, oceanographers in terms of oceanic currents, geologists in terms of permafrost, et cetera. 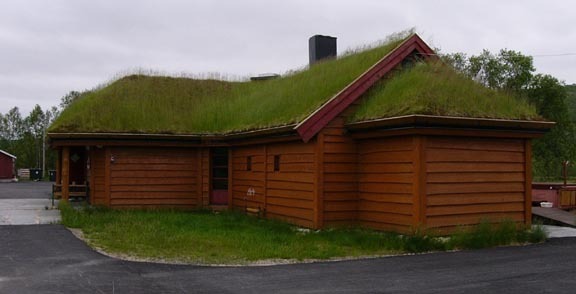 Each of those definitions engenders its own set of boundaries, much more irregular than the Arctic Circle – but all under study by someone, we learned at the Arktikum. It was a good place to learn as much as you could stand about the greenhouse effect and what recent changes in the content of our atmosphere are doing to arctic regions. 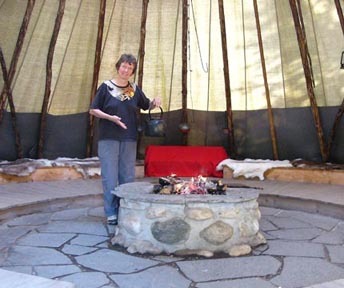 Much of the exhibit space, though, was given over to information about the lives and culture of the native peoples of Scandinavia’s arctic region – the people who were called Lapps or Laplanders when I was in school, but have now been given the "privilege" of going by their own name for themselves, the Sami. 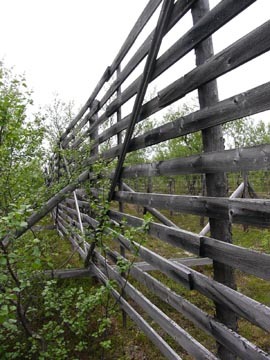 All of Finland, Sweden, Norway and some of Russia north of the Arctic Circle is Sapmi, the land of the Samis, and they now have their own governments – a situation similar to the indigenous peoples in the US at this point: they get to govern themselves within the context of the laws of whichever country has included their part of Sapmi within its boundaries. 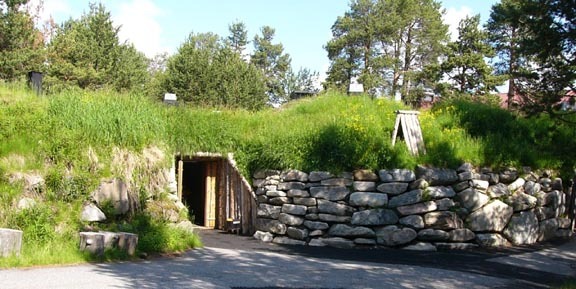 We learned – not at the Arktikum, but at the Sami’s own museum the next day, farther north – that this situation was not always so. A young woman guide at that museum – she looked about high school age, and her English was as good as mine – told us that when her father went to school, assimilation was still the national policy, albeit more unconsciously than aggressively; Norwegian and English were the languages taught in the schools then. 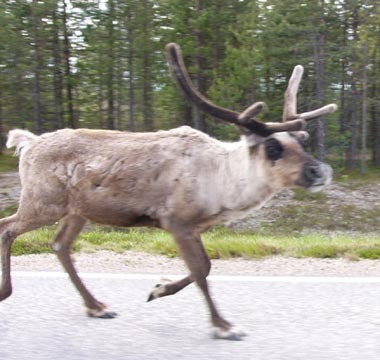 But then in the 1980s two large hydropower projects were proposed for the far north, and the Sami people – most of whom are still intimately involved with the reindeer, in what now amounts to "reindeer ranching" – decided they had had enough. There were major demonstrations down in Oslo – sit-ins, teach-ins, people handcuffing themselves to doors, followed by people beaten on and arrested, but finally attention was paid. This was also a time when there was a growing international awareness of, and empathy for, indigenous peoples being overrun elsewhere by our benevolent Western Civilization. 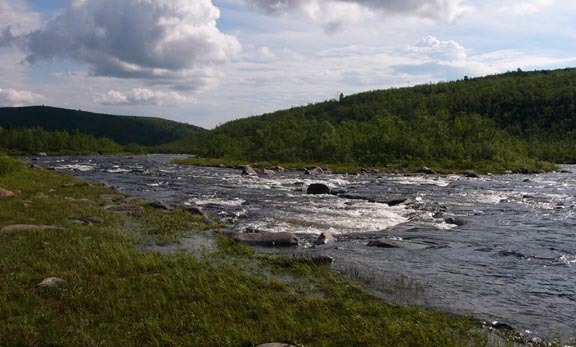 Between the first and second hydropower dams, major concessions were made to the Sami people in all the northern countries; in a sense they became, or are becoming, a conscious, and consciously recognized nation unto themselves. One of the most interesting exhibits in the Arktikum museum was a visual presentation of an ongoing study by anthropologists and other social scientists at the University of Lapland, looking at the impacts of tourism on a culture that has, until relatively recently, been fairly isolated from the rest of the world. 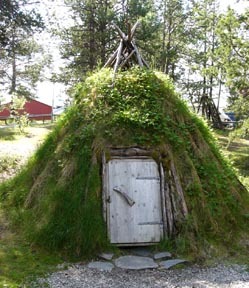 In a sense, the Sami had lived in their own universe until the 20th century, and are just now becoming aware of themselves as an interesting culture that is marketable – so long as it retains its interesting qualities! This is, of course the dilemma that all tourism cultures face to some extent or another…. We would go from a big-tree forest into a long stretch of scrub forest with no noticeable change in altitude or exposure or anything else to easily explain the difference. It may have just been stages in the evolution of soil sufficient for plant life because this area was under thousands of feet of ice not too long ago, and was pretty well scraped down to bedrock. The bedrock is everywhere pretty close to the surface, even down in southern Finland where the trees and plants are very “civilized” – but where naked black rock juts up every so often to remind us how thin the skin of life is on earth…. The guidebooks we’d consulted all warned us to keep an eye on gas gauges and kilometers between places, but we were almost disappointed at how settled the area really is. The petroleum culture is there in its usual strength, and except for the realization that the low-sounding prices are for liters rather than gallons, a gas station and convenience store in Sapmi is pretty much like a gas station and convenience store in the valley. 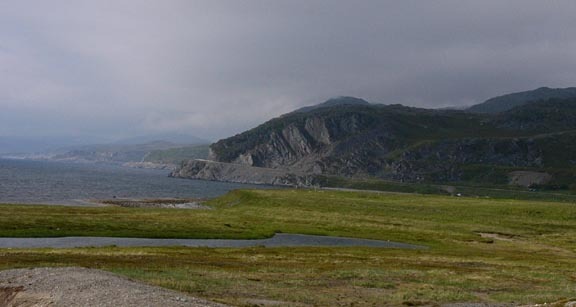 Our original destination above the Arctic Circle had been to get to a place called Nordkapp, North Cape, which is the farthest point of land in Europe, nothing beyond but the Arctic Sea, sea ice and rocks, and the North Pole. But we ran into a couple of tire salesmen in our hotel who, in addition to reacquainting us with akva vit (that’s probably not spelled right but akva vit makes you not care), told us that Nordkapp is a big ripoff – busloads of tourists are taken there, there’s a hefty toll (about $25 per person), and it has essentially been turned into the Pike’s Peak of the far north – the world’s northernmost parking lot. A word about roads in Finland and far northern Norway. They are definitely inferior to American roads – but probably not so badly inferior as our public transportation is inferior to theirs. Just as we have state and federal highways, they have national and “European” highways – roads with an “E” in front of their number. But all of them – national highways and E-highways – were fairly narrow, and had almost no shoulders. Bicyclists – of which we saw a few but not as many as I’d expected – really had to ride a tightrope to stay out of traffic without ending up in the borrow ditch. Quite a few of the roads we traveled had no line down the center, just dotted lines along the edges. We interpreted this to mean – correctly, I think – that the road was not really wide enough for two lanes, so no sense in putting in a center line, and let the fittest survive. These roads were posted as 70 kilometer-per-hour roads (~40 mph), but people seemed to drive them about 90 kph (~60 mph), and scootching past oncoming trucks was hard on the nerves of passengers.